There are some unusual terms used in the healthcare industry, but “Hadoop” may be near the top. As a big data framework, Hadoop distributes enormous amount of data collections across multiple nodes within a cluster of commodity servers. It provides immense data storage and doesn’t require the purchase of any costly custom hardware. Enables healthcare organizations to perform numerous data tasks at once. Only 34 percent of enterprises don’t see Hadoop as a pressing issue. Enterprises that implemented Hadoop technology would most likely benefit in the following areas: advanced analytics (48 percent), big data source for analytics (45 percent), exploratory analytics with big data (44 percent), data warehouse (37 percent) and information exploration and discovery (36 percent). The most likely barriers to implementing Hadoop technology are inadequate skills or difficulty finding skilled staff (42 percent), lack of compelling business case (31 percent), lack of business sponsorship or data governance (29 percent) and security for Hadoop data (29 percent). 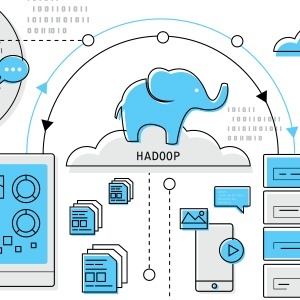 Enterprises utilize Hadoop as a data hub (16 percent), queryable archive for traditional enterprise data (12 percent) and business intelligence (21 percent). Healthcare organizations that want to cost-effectively handle their data may want to consider getting in on the Hadoop trend. According to Research and Markets, the global Hadoop market is forecast to grow at a CAGR of 59 percent from 2016 to 2020. Syntrix Consulting knows cutting-edge healthcare technology and can work with healthcare organizations of all sizes to utilize it to best fit their business needs. Our certified consultants will work with you to ensure your IT analytic resources are optimized to enhance your clinical, financial and operational performance. Contact us for a free consultation.